Passive heatsinks are designed to move heat away from a computer's central processing unit without using a fan. 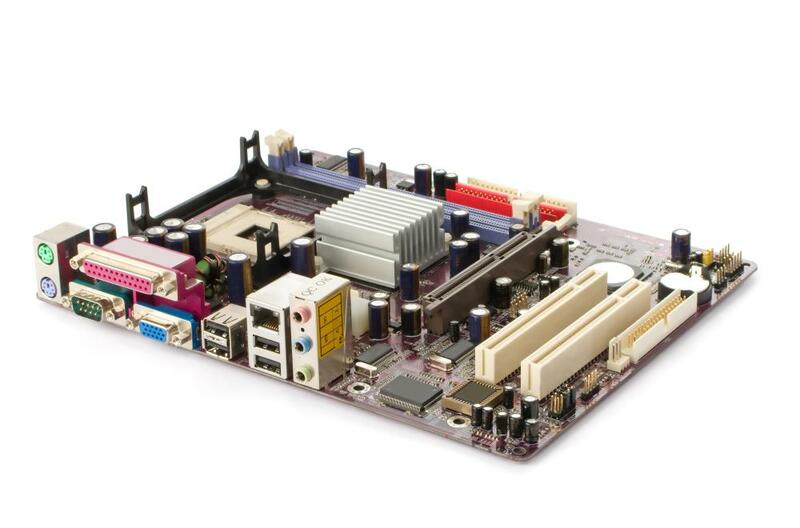 Many motherboards come bundled with fanless heatsinks already attached to various Northbridge or Southbridge chipsets. A motherboard heatsink is a cooling device installed on computer processing units (CPUs) and chipsets. There are two basic types of heatsinks: active and passive. An active heatsink employs a fan, while a passive model is fanless. The fan included in an active heatsink helps cool the surface of the device for added efficiency, while a fanless heatsink uses more surface area to dissipate heat, compensating for lack of a fan. Advantages of a fanless heatsink include silent operation and avoidance of potential chip damage due to fan failure. 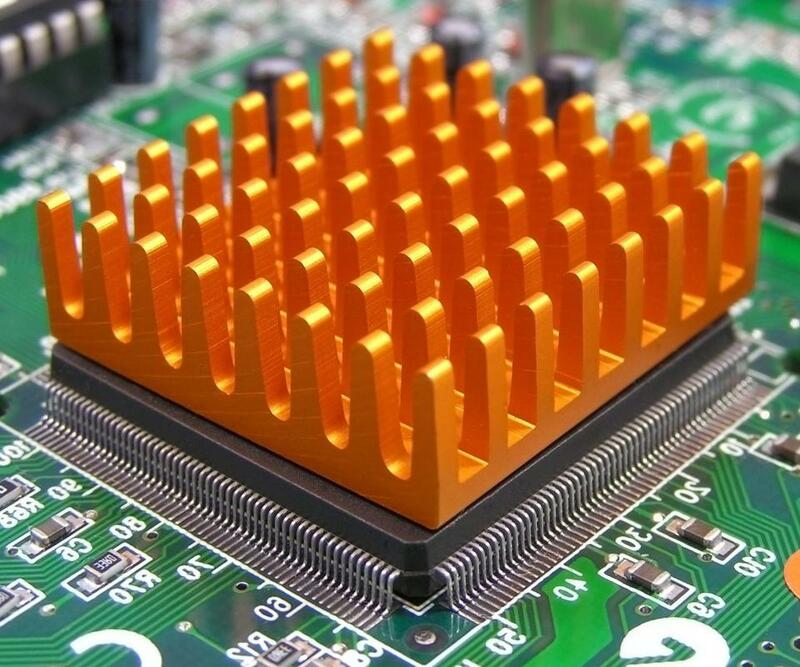 A heatsink is made of affordable materials that have a high rate of thermal conduction, or the ability to act as a funnel for heat dissipation. Aluminum alloys are lightweight and inexpensive. Copper is heavier and a bit costlier, but has twice the thermal conduction rating of aluminum. Some heatsinks are made of both materials. A heatsink has a square base designed to fit over the chip face. The base supports rows of vertical pins or fins, depending on the design, that may be angled or straight. While the base allows heat to move from the chip into the heatsink, the pins or fins create sheer surface area that remains cooler than the base. Heat is naturally drawn into the cooler areas where airflow allows the heat to dissipate. An active heatsink features a small fan over the fins to help this process of cooling along. A fanless heatsink relies on case fans for air circulation. Since this is less direct method, a passive heatsink is typically much larger than its cousin, providing more surface area for greater efficiency. Due to the larger footprint that most passive heatsinks have, they can be tricky to fit into smaller cases and measurements should be taken for tolerances prior to purchase. Heatsinks attach to chips through various means, depending on the model and the chip it is designed to cool. The attachment methods include z-clips, spring-loaded arms, and other methods, but they all apply a load to the heatsink to ensure excellent contact between the base and chip. Due to the extra weight of a fanless heatsink, some models require removal of the motherboard to install a more stable retention system. Regardless of the method used to attach a heatsink, a thermal compound must be placed between the heatsink and chip to fill microscopic voids that would otherwise trap air, reducing thermal conduction between the two surfaces. Thermal tape is a low-cost product that is sometimes used, but generally thermal pads or tubed grease products are more highly recommended. Many websites are dedicated to the testing of these compounds, which can contain silver and micronized diamonds. Whether passive or active, a heatsink should never be used without thermal compound. While some might find the somewhat massive, fanless heatsink an eyesore, its silent operation is music to the ears for those interested in keeping down the decibels. More importantly, there is no way for it to fail when properly installed on the correct chip. If an active heatsink’s fan stops working, it can easily go unnoticed until it’s too late. A heatsink designed to work with a fan will not be able to keep a chip cool for long, once its fan stops spinning. When researching products for possible purchase, be sure to check with the manufacturer of the CPU or chipset first for recommendations and relevant warranty information. Some heatsinks and even some compounds might be pre-approved by the manufacturer, and using a fanless heatsink that is not tested or approved might affect or even void the chip’s warranty. Once you know the possible models and compounds you can choose from, user forums are a great place to get additional advice and feedback, and many online retailers feature customer reviews. How do I Choose the Best CPU Heatsink? What is a Fanless Power Supply? What is a Heatsink Socket? What is a Heatsink Bracket? What is a Heatsink Thermal Pad? What is a Low Profile Heatsink?